Engagement & Wedding Sets...Shop and buy at discount prices from Michaels Jewelers!... Your source for discount fine jewelry since 1984. Beautiful Hearts and Arrows Ideal Cut Diamonds!...we have most sizes, colors and clarities in stock now and our prices are too low to print here...please call for prices! Coin Jewelry...Our entire inventory of American Gold Eagle and U.S. Gold coin jewelry is on sale now! We have pendants, money clips, cuff-links and more!...all at discount prices! Buy certified ideal, round, princess and marquise cut diamonds. All at discount prices! 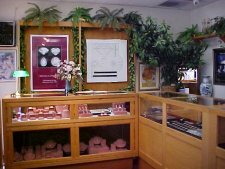 Don't forget to check out our gemstones!